Bookings are for 1 hour durations and we supply everything needed to play. The £20 game fee per person (minimum 10 players) includes hire of JT Splatmaster pump marker, full head protective Goggles, Armoured chest pad and unlimited paint. Whatever the occasion (small groups/clubs, paintball parties) we have the perfect package to suit everyone. Pricing is £200 for 10 players (£20 per player inclusive of paintballs) for a 1 hour duration. If you require a booking for more than 10 players this is not a problem as we can cater for up to 40 players for each 1 hour session. 10 players £200.00 for 1 hour session. For all Splatmaster Kids bookings payment is required in full at time of booking and is non-refundable or transferable. Prices inclusive of Splatmaster pump action marker, full head protective goggles, chest protector and unlimited paintballs. 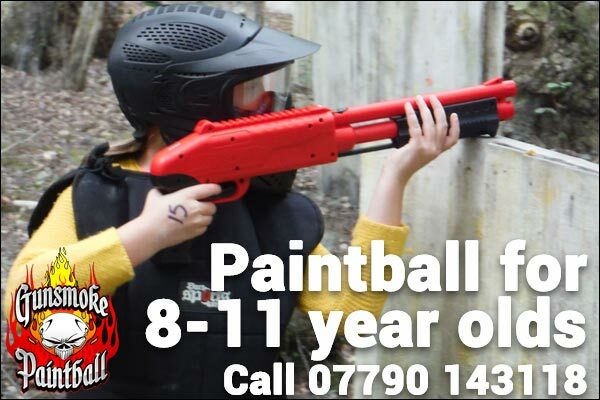 To book your Splatmaster paintball session, you can complete the contact form or alternatively call Julie on 07790 143118 or alternatively email Julie@gunsmoke-paintball.co.uk stating Splatmaster paintball booking.